Size of this preview: 800 × 532 pixels. Other resolutions: 320 × 213 pixels | 3,000 × 1,995 pixels. 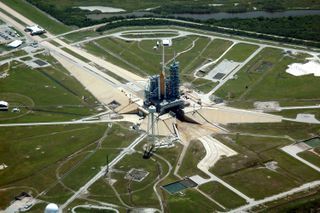 English: An aerial view of Launch Pad 39B and surrounding area at NASA's Kennedy Space Center, showing the Space Shuttle Discovery at center. Slovenčina: Pohľad na oblasť Štartovacieho komplexu 39B s raketoplánom Discovery. current 08:50, 15 August 2013 3,000 × 1,995 (909 KB) Chuzzard (talk | contribs) Kennedy Space Center's launch pad.